Your familiarization with Uzbekistan will never be complete unless you sample dishes of Uzbek cuisine, for any nation’s cuisine is an essential part of their history, culture and mentality. Authentic Uzbek pilafs, shashlik kebabs and other dishes can be enjoyed only in restaurants, chaykhanas (“teahouses”) and homes in Uzbekistan. Today’s Uzbekistan’s restaurants boast a wide variety of exquisite interiors ranging from traditional to modern ones and high quality services, including live music and shows. Besides Uzbek cuisine, they offer Russian, Korean, Caucasian, Chinese, Japanese, Mediterranean and other dishes. Vegetarian and healthy diet cuisines are also available in some of the local restaurants, and the number of such ones is growing. 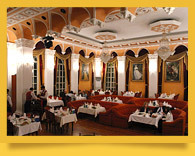 The following is the information and photos on the best Tashkent restaurants, cafes and chaykhanas (“teahouses”). Besides large and luxurious restaurants, Tashkent is rich in small ones - cafes or traditional chaykhanas - where you can enjoy delicious yet inexpensive meals. Some cafes are just private Uzbek houses offering authentic Uzbek cuisine menus: pilafs, shashlik kebabs, samsa pasties, manti dumplings, lagmon noodle soup, shurva soup and others. Since it is warm from March to November in Tashkent, most of the restaurants in the city have lovely outdoor eating areas. They are especially attractive in the old part of Tashkent, in and around Chorsu Bazaar. When you are in the city, we strongly recommend that you also visit Osh Markazi (“Pilaf Center”) where they cook real Uzbek pilafs in huge cauldrons. Pilaf is a signature dish of Uzbek cuisine, so they often say in Uzbekistan, “Make pilaf, not war.” Many Tashkent restaurants also offer Russian, Korean, Chinese, Japanese, Mediterranean and other dishes, including vegetarian and healthy diet ones. 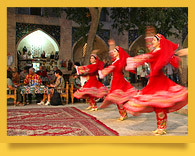 In addition, many of the restaurants entertain their guests with live music and various shows, including traditional Uzbek dance. Most Samarkand restaurants and cafes offer traditional Uzbek dishes. However, the number of restaurants with vegetarian and healthy diet cuisines in the city is growing. There are a lot of small cafes and traditional Uzbek houses acting as cafes, providing unique opportunities to enjoy the local home-level hospitality flavor. When you are in the city, we strongly recommend that you sample the local shashlik kebabs and pilaf, which is different from the pilafs cooked in other provinces of Uzbekistan. (Every Uzbek province has its own pilaf recipe.) And you should never miss the famous Samarkand flatbreads – most delicious and stale-proof. Visiting a traditional Samarkand chaykhana (“teahouse”) will also be beneficial: besides sampling Central Asian sweets with green tea, you may learn a rare recipe from the chefs and witness the exciting culinary process. 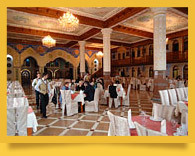 Many of Bukhara restaurants and cafés are located in the historic part of the city, near the famous architectural complex Lab-i Hauz – Bukhara’s major tourist attraction and cultural center. There is even a restaurant housed right in the madrasah of Nadir Divan-Beghi (dating from the 17th century), one of the edifices of the complex. Most of the restaurants offer traditional Uzbek food: Bukhara pilaf, shashlik kebabs, manti dumplings, large samsa pasties and others. Many of them add European and other dishes to their menus, including vegetarian and healthy diet ones, and entertain their guests with live music and national dance shows. 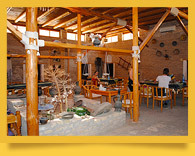 Khiva cafes and restaurants located in the historic city of Ichan-Kala are probably the most enjoyable. Some of them are housed in heritage madrasahs and boast most impressive historic interiors. The cuisines include unique Khorezmian dishes: Khorezmian pilaf, which is different from other Uzbek pilafs; tukhum barak dumplings with eggs; shuit oshi green noodles made of dough with herbs, in a mulligan stew. We recommend that you visit the local traditional house restaurant to enjoy the local home-level hospitality flavor, homemade quality food and folk dance shows. 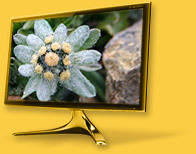 © Material is belonged to «Central Asia Travel».